The technology designed in the project could allow countries to avoid using expensive fiber cable that would have to be installed underground to allow users to connect to the Internet. Google feels this will greatly increase Internet usage in developing countries in regions such as Africa and Southeast Asia that can’t afford to lay underground fiber cable. The high-altitude polyethylene balloons fly around the world on the prevailing winds (mostly in a direction parallel with lines of latitude, i.e. east or west). Solar panels about the size of a card table that are just below the free-flying balloons generate enough electricity in four hours to power the transmitter for a day and beam down the Internet signal to ground stations. These ground stations are spaced about 100 km (62 mi) apart, or two balloon hops, and bounce the signal to other relay balloons that send the signal back down. 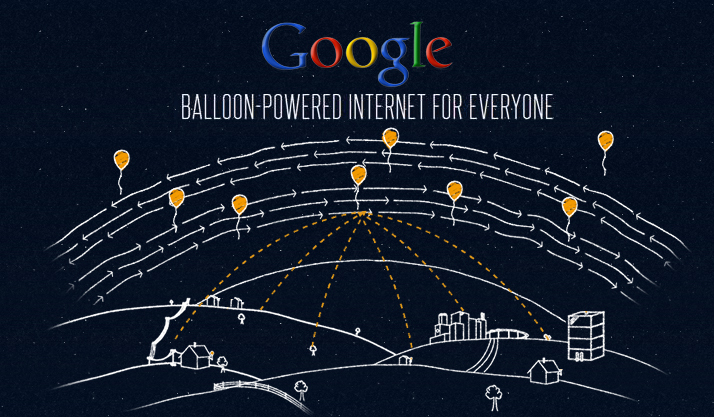 This makes Internet access available to anyone in the world who has a receiver and is within range of a balloon. Currently, the balloons communicate using unlicensed 2.4 and 5.8 GHz ISM bands, and Google claims that the setup allows it to deliver “speeds comparable to 3G” to users. It is unclear how technologies that rely on short communications times (low latency pings), such as VoIP, might need to be modified to work in an environment similar to mobile phones where the signal may have to relay through multiple balloons before reaching the wider Internet. 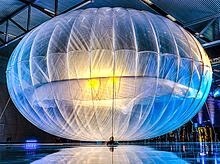 The first person to connect to the “Google Balloon Internet” after the initial test balloons were launched into the stratosphere was a farmer in the town of Leeston, New Zealand, who was one of 50 people in the area around Christchurch who agreed to be a pilot tester for Project Loon. The New Zealand farmer lived in a rural location that couldn’t get broadband access to the Internet, and had used a satellite Internet service in 2009, but found that he sometimes had to pay over $1000 per month for the service. The locals knew nothing about the secret project other than its ability to deliver Internet connectivity; but allowed project workers to attach a basketball-sized receiver resembling a giant bright-red party balloon to an outside wall of their property in order to connect to the network. The high-altitude balloons fly twice as high as airplanes, but below the range of satellites. Each balloon provides Internet service in a 20 km (12 mi) radius covering an area of about 1,256 km2 (485 sq mi).